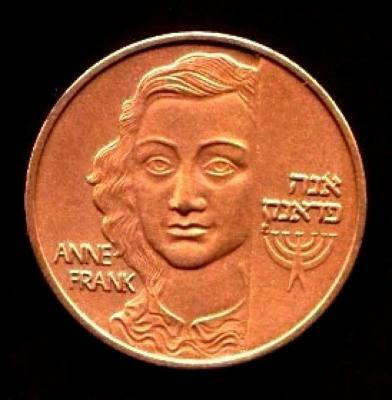 Obverse: Anne Frank’s face emerges from behind a half open door, symbolic of the Jewish people’s emergence from hiding at the end of the Holocaust. The young diarist’s name in Hebrew, and a menorah with one lit candle – symbol of hope – based on a drawing by Israeli children, commemorating Anne Frank. The flame forms part of the last letter of Anne Frank’s name in Hebrew. The artist’s signature. Edge: The Corporation’s emblem and initials: IGCMC – מממת and a serial number. Silver medals: Sterling 925. Gold medals: milled edge. Design: Alex Shagin, world-renowned medallic artist, who emigrated from the Soviet Union, after having designed the USSR’s 1980 Olympic coin series, in search of artistic freedom and his Jewish identity.